There are many different franchise opportunities available to entrepreneurs with the budget for them. But, there are certain entrepreneurs that will not just immediately hop on the best franchises listed in a magazine or in a blog post online. Some entrepreneurs are passionate about caring and educating children while giving back to the community. For those types of entrepreneurs with a passion for childcare, a daycare franchise is the only business opportunity worth considering – even if it does require quite a bit more work than starting a vending machine business. If you are one of those passionate people, you are sure to find success by opening a daycare franchise. Find out how to prepare for life as a daycare franchise owner using these daycare franchise tips detailed below. Before you choose which daycare franchise to open, hire a franchise lawyer. Franchisee attorneys will help to ensure that you get the best business deal possible for yourself. They will also have expert knowledge and advice to pass on to you about the franchising process and what it is like to be a franchise owner. Childcare franchises that you are considering will also take you much more seriously if you already have a franchisee attorney representing you. This is a crucial part of developing a good rapport of shared respect between franchisor and franchisee. Make sure to hire a franchisee lawyer to navigate the process of buying a childcare franchise. When you open a daycare franchise, you need to have a fire escape plan in place. Of course, this is something you need for all business operations, even if they do not mention it on the entrepreneur TV shows you watch. However, it is even more crucial when you are dealing with peoples’ children. You want to be able to assure prospective parents that their children will be safe in your plans. That not only does your business have a plan, but that you know the plan inside and out firsthand. Consult with all the appropriate authorities to develop a fire escape plan that keeps all daycare attendees safe, calm and happy. This is one of the most important steps to prepare yourself to own a daycare franchise. Be ready to train daycare employees extensively. Most of the employee training programs should take place before you even open your daycare’s doors. You want to make sure that everyone is familiar with franchisor operations and employee guidelines. In addition, you should also provide additional training on childcare best practices and similar. This way, your team uses a cohesive strategy to provide childcare to children of all different ages, backgrounds and abilities. If you want to succeed in the daycare franchise business, you need to be ready to provide intensive staff trainings on childcare, franchise operations and employee conduct guidelines. That way, your childcare business will stand out from less-trained competition. Prepare to be tired. That should be the first thing you expect as a franchisee. It is especially the case when you are opening a daycare franchise. Starting a childcare franchise is exhausting. But, running one is even more tiresome. You will be responsible for the usual business operations management tasks business owners are tasked with. On top of that, you will also have dozens of loud, energetic children in your presence almost all day every day. This is emotionally, physically and mentally draining. You will be tired all the time. This is something that you will need to be personally prepared for before opening a daycare franchise. If you cannot deal well with this kind of deep exhaustion, you may want to look into other franchise opportunities to get your start in business. Do not be afraid to ask for handouts from your franchisor. They are their to help support your childcare business in its pursuit of success. Ask them for whatever assistance you need. There may be additional franchisee resources that you would otherwise not be aware of if you did not simply ask. 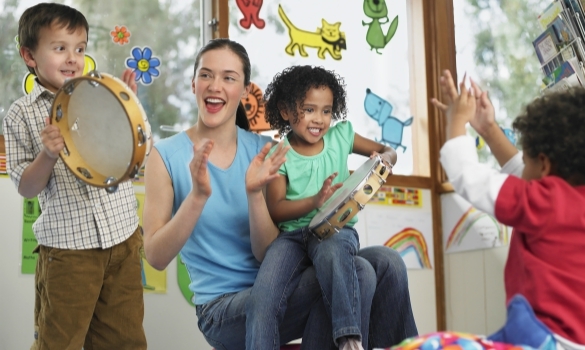 Many daycare franchisors offer additional marketing supports for franchisees. They also provide operational training and assistance. If you want to have the best chance at success owning a childcare franchise, lean on your daycare franchisor to help you out. Ask for any and all additional daycare franchisee support materials they can provide to help you achieve your business goals. Starting a daycare franchise is not all that different from starting a franchise in general, as long as you know what a franchise is. However, there are some steps you can take to better prepare to become a daycare franchise owner. This way, you increase your chances at success as a daycare business owner. Heed the bits of advice detailed above. These daycare franchise management tips will help you prepare to own a child care franchise. It is quite a hectic life. But, it is worth the effort if you are passionate about children. Let these daycare franchise owner tips give you an edge on all your business competition, so that you can be one of the few franchises to succeed in the long-term.